Today's blog post covers the first sign that spring has come to the American Midwest. Mulch bags. The corner gas stations stack up palette after palette of yard mulch in see-through plastic bags. This is the sign for do-it-yourself gardeners that it’s time to rake up lawn debris and any recalcitrant leaves that blew into the flower beds after leaf rakes were put away for the winter. Once the beds are prepped, a new layer of mulch gets added to hold in moisture for the plants and to dress up the beds’ appearance. 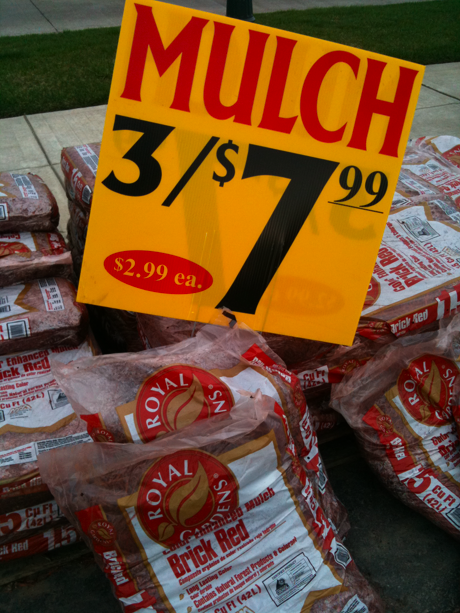 The shredded bark mulch comes in two formats: natural “wood-colored” and tinted (red, black, or dark brown). At my local Speedway station, I know it's spring when the palettes rise over six feet tall and completely obscure the gas pumps from view. mulch = shredded organic material from trees, used to top-dress bedding plants and keep moisture in. Another mulching material is ground-up tree branches. The chunks are less consistent in shape and texture, less attractive, sold in bulk (instead of bags), and therefore, less expensive. Watch this blog for the other two signs that spring is on the way!